In January the number of foreign tourists ramps up in Yucatan, especially in the frontier town of Valladolid, but yesterday according to one report the town experienced little tourist traffic. If true, it could be a sign that a boycott of Yucatan state visitor destinations by travel agencies in the neighboring state of Quintana Roo is real, and if it persists, will result in thousands of people losing tourism-related jobs. 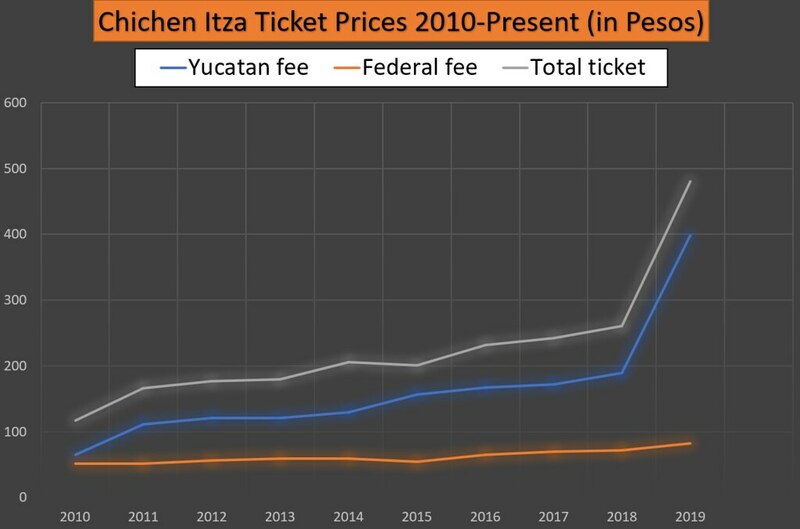 In late December, the Yucatan Legislature and new state governor more than doubled admittance fees on foreign tourists to all of the state’s tourist attractions: Chichen Itza (to more than 470 pesos or almost $25 USD), Ek Balam, Uxmal, et. al. The drastic price increase was set to take place Jan. 1, but in response to immediate pushback from tourism operators, was postponed to Feb. 1. In addition, the state agreed to honor any tickets purchased prior to Feb. 1 at the old price until April 30. Both the price increase and then postponement were done without input from the groups that reportedly provide the largest number of foreign tourists to Yucatan attractions, the travel operators based in the tourist-rich Maya Riviera towns of Cancun, Playa del Carmen, or Tulum. One association covering 70 operators, the Quintana Roo chapter of the Mexican Association of Travel Agencies, called for a boycott that began Monday. While its member agencies would honor tours to Yucatan sites it already had sold, it would not sell any new tours. However the association is not only demanding a slower increase in ticket prices, it also is demanding several long-promised reforms to the management of Chichen Itza specifically. For more than 15 years vendors have been allowed to sell trinkets inside the archaeological zone. Every day more than a 1,000 vendors flood the site, and for years the tourism operators have had to deal with the complaints from its customers. The tourist operators will no longer tolerate the vendors, said González Rubier. The tourism operators want the state to create a plan, with measurable milestones linked to dates as to when the vendors will be removed from the archaeological zone. Unless its demands are met, the tourist organization is promising to not only continue the boycott, but to badmouth Chichen Itza and Yucatan locations to its customers. Any tourist who insists on going to Yucatan will be taken under warning of the problems that exist there, Gonzalez Rubieria reported told La Jornada. Another tourist-operator organization, the Mexican Association of the Tourism Industry (AMIT), has not publicly committed to the boycott, but if the remarks by President Rosa Isela García Pantoja are any indication, it has the same complaints as the rival Mexican Association fo Travel Agencies. While these two organizations are rivals, it appears that they are in lockstep that not only is the increase in ticket prices “too much,” but also the time has come to correct the other deficiencies, especially those at Chichen Itza. The government of Yucatan state has yet to make any official pronouncements regarding the boycott or the demands for reform. Stay tuned. The state of Yucatan nearly doubled the entrance fee to Chichen Itza beginning Jan. 1, 2019. Similar increases were applied to all the archaeological zones within the state borders in the northwest corner of the Yucatan Peninsula. The entrance fee is actually two fees, one by the federal government and the other by the state of Yucatan. The federal fee has grown steadily over the past several decades. The state fee, which was instituted in the 1980s, in recent years has exploded. In the last ten years the state ticket fee has increased six-fold. Over the same period, the feds increased its portion by only 60 percent. In the most recent increase, the state portion went from 189 pesos to 398 pesos. There appears to be some confusion among news sources about the federal ticket price, but most reliable reports state it increased from 70 pesos to 75. If correct, the overall ticket prices at Chichen jumped from 259 pesos to 473 pesos. While there has never been a price increase as drastic as the latest, in 2010 the state boosted its portion of the entrance fee by 85 percent. That was the year Yucatan purchased the land in Chichen Itza’s main archaeological zone. The handling of the price increase was somewhat of a political debacle. The state announced the increase, but after pushback from tourism operators, agreed to postpone it more than a year. A few weeks later it abruptly changed its mind again and instituted the increase. In the months following that price increase, the number of visitors to Chichen Itza dropped by half, however the Yucatan administration at the time claimed it had nothing to do with the price increase . Similar to the 2010 increase, tourism operators have launched political pushback. The Mexican Association of Travel Agencies branch in the neighboring state of Quintana Roo, the travel destination of millions of foreign tourists, estimates its members have already sold more than a half million tours to Chichen Itza set for 2019. The sudden doubling of entrance fees means that tourism operators face losing as much as $137 million Mexican. Unless some accommodation is made, the Association is threatening of boycott of Chichen Itza. The association estimates that almost two million visitors to Chichen Itza, the vast majority who visit the ancient city, originate from Quintana Roo destinations of Cancun, Playa del Carmen, Tulum, and others. Michelle Fridman Hisrsch, the new Secretary of Tourism Development for the state of Yucatan, told La Jornada that talks are being held with various tourism representative organizations to find a way to minimize the impact of the increase on pre-sold tours. Fridman Hirsch downplayed the impact of the increase because it is being charged to foreign tourists, not Mexican nationals. Fridman Hirsch defended the increase, stating that it was necessary and brings the fees to the level they should be. 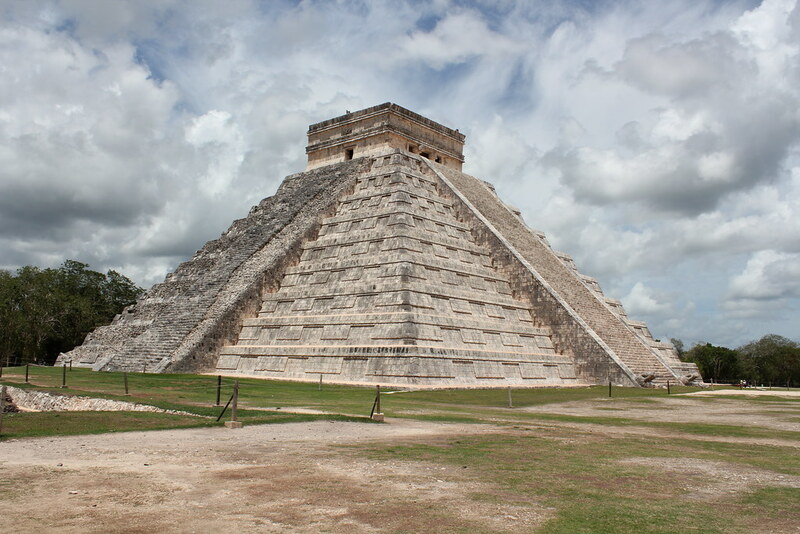 Fridman pointed out that of the “World Wonders,” a ticket to see Chichen Itza is the least expensive by far. In this, Fridman Hirsch is correct, as sites such as Petra and Machu Picchu charge the equivalent of $50 USD. Chichen is less than $25 USD after the increase. However, the last giant price increase in 2010 used the Colisseum in Rome as its comparison. Today it costs 12 euros to enter, which is now less than half the cost to enter Chichen. In more recent interviews and conversations with reporters, Fridman Hirsch has been walking away from the debate, claiming her agency, SEFOTUR, was not involved in the increase. She also said that, to her knowledge, there had been a study in advance of the price increase that defended the higher fee. The reason behind the large increase is not a mystery. If the boycott fails to gain traction or foreigners are not scared off by the price incrase, Yucatan looks to have a big payday. A reporter at El Financiero did the math and estimated that revenue to the state could increase by $330 million (Mexican) every year assuming attendance figures in 2018 match this year. That doesn’t include additional revenue from other Maya sites such as Uxmal or Dzibulchaltun. I devote a chapter in my book about the “gringo” history of Chichen Itza to the “gringas.” It’s one of the longest chapters in the book and I could have written much, much more. The women who explored and tamed Chichen Itza were practical and capable, unlike many of the men, who were dreamers and, much of time, rash and foolish. The hubris of the early archaeologists and developers of Chichen is a major theme of the book, hence they get most of the ink (not to mention the book title). One day the women of Chichen will get their respective due. As today is “International Women’s Day,” below is an excerpt from my chapter, covering the period of the late 1920s and 1930s and featuring Carmen Gomez Rul Castillo, Frances Morley, Anne Axtell Morris, and the unnamed “virgin” who talked her way out of sacrifice into the Sacred Well. The rest of the chapter covers Tatiana Proskouriakoff and Elva Legters, who were influential during that period. And the book is peppered with other women who played important roles during the discoveries and commercial development of Chichen Itza, including Alma Reed, Victoria (Marrufo) Manjarrez, Alice Le Plongeon, Adela Breton, Henrietta “Etta” Thompson, Carmen Barbachano y Gomez Rul, Isabel “Belisa” Barbachano Herrero, and Maruja Herrero Garcia. FERNANDO BARBACHANO PEON may get the credit for building Yucatán’s tourism industry, but he did so in partnership with his wife, Carmen Gomez Rul Castillo. And hers arguably was the hardest job. She ran the Mayaland Hotel—trained and managed the staff, planned the menus, supervised any new construction—and did it all while caring for her five-year-old son, Fernando, and a newborn baby girl, Carmen Barbachano y Gomez Rul. While her husband was in Mérida building that end of the business, she was at Chichén insuring that her customers had every luxury and more importantly, were insulated from the reality of living in the bush—thriving scorpion populations, the occasional poisonous snake, and at least once, the majestic jaguar, whose wet paw prints were discovered on morning leading away from the hotel fountain. Between the Mayaland and the Hacienda Chichén was doña Victoria, who fed the Carnegie workers and later took in visitors. Her husband, Carlos Marrufo, and her sons frequently were away, leaving her run her little inn. These three women had little interaction with each other; even though they lived within a few hundred feet of each other, their lives did not appear to intersect with any regularity. Of the three, doña Carmen had the greatest challenge. While the Carnegie Institution refused to hire Maya as servants in the main house (considering them unfit for domestic service), doña Carmen had no such luxury. She depended upon local labor to clean the hotel rooms, work in the kitchen and laundry, and maintain the grounds. Few, if any, of those she hired had any experience at all. Her workers were farmers who grew maize or laborers who rebuilt the ancient Maya temples for the Carnegie. Or they were young girls hired from the villages and who wore huipils. They lived in Maya nas with packed dirt floors and hammocks in which to sleep. They had no experience cleaning buildings with tile floors and modern bathrooms. They had to be taught the proper way to strip a bed and then make it, even though they themselves would probably never spend a night in one over the course of their entire life. They had to be trained how to serve drinks in glasses filled with ice even though they drank from hollowed dry gourds. They learned to set a table with silverware, plate, and napkin, even though they had no use for such things for in their homes the tortilla served all those purposes and was edible to boot. The only oral legends that mentioned women at Chichén Itzá were about those who were sacrificed into the Cenote Sagrado, but there was one well known story of the woman who said, “no.” Like the other sacrifice victims before her, this woman was led into the little shrine at the lip of the Sacred Well where the priests explained that she would be lowered by a long rope into the cenote thirty meters below and dunked repeatedly until she encountered the gods, or until she died, whichever came first. If the gods came to her, they told her to ask for rain. “I will ask no such thing,” she said. Instead she would tell the gods to send no maize or anything at all. “The boldness and assurance of that virgin in her speech had so great an effect that they left her and sacrificed another in her place,” according to a Spanish monk who documented the tale. A millennium later, another strong-willed woman Ann Axtell Morris ventured into Sacred Cenote, not as a sacrifice but of her own free will. She lived at the Hacienda Chichén for several years assisting her husband Earl with his excavations of the ancient monuments for the Carnegie. She eventually became a skilled excavator in her own right, in addition to her work as a staff artist. According to Axtell Morris, there were two types of archaeologist wives: Those who stayed at home and those who joined their husbands on their expeditions. Of the latter, acceptance among the husband’s archaeology colleagues had to be earned. “The poor newcomer who presumes to break into the sacrosanct circle must stand trial by fire, till it is decided she is all right,” Axtell Morris once observed. One afternoon in the late 1920s, Axtell Morris, her husband, and two other men wanted an adventure to escape the tedium of archaeology. They found they could reach the waters of the Cenote Sagrado by climbing down a tree that was growing on a ledge about halfway down the cliff. They made it the rest of the way by shinnying down one of the tree’s thick, exposed roots that stretched to what Axtell Morris described as a “small beach.” She apparently did not know the beach was man-made, the tailings left behind by Thompson’s famous dredge two decades earlier. As they stood on Thompson’s Beach, the quartet marveled at the thought that under the jade green waters was a fortune in Mayan treasure. The four spent the afternoon lazily swimming the cenote. When the sun disappeared over the lip, the shade gave the appearance that twilight was only a few minutes away. The party hurriedly dressed on the beach and one by one the men climbed up the root, then up the tree and out of the cenote. They threw down the end of a rope and instructed Axtell Morris to tie it around her waist as a safety harness. Morris, unaccustomed to ropes and knots, put too much slack in the loop around her body. As she crawled up the tree root, the oversized noose began to slip over her head. She panicked, let go of the tree root and grabbed the rope with both hands. The three men had no choice but to haul her up, unceremoniously banging her repeatedly against the wall of the cenote. Another year, another ticket price increase. But not at Chichen Itza, at least not as far as the federal portion of the ticket price is concerned. In 2017, the total ticket price to enter Chichen Itza for non-Mexicans was 242 pesos, of which 70 pesos went to the federal government. This year the federal government announced it was holding to the 70-peso price. As yet we have not heard what the state of Yucatan has decided for 2018, but last year the fee was 172 pesos. The state has announced that the price of the nightly light-and-sound show has increased to 453 pesos. The nightly light-and-sound show at Chichén Itzá has been free since it launched two years ago. That ends Nov. 1. Earlier this week tourism authorities in Yucatán State announced that the show will cost 434 pesos (approx. $22.50 USD) beginning Nov. 1, 2016. This isn’t the first time that officials have said they would begin charging for the show, but this time they called a large press conference. As reported by the Diario de Yucatán, the new fee was revealed at a joint press conference of federal and state authorities. The announcement was made by representatives from the Secretaría de Fomento Turístico (Secretariat of Tourism Development) of the Instituto Nacional de Antropología e Historia (National Institute of Anthropology and History or INAH), the federal agency that oversees Chichén Itzá. They were joined by representatives from two state agencies: Patronato Cultur (the state agency known as CULTUR) and the Agencia de Administración Fiscal (Agency of Fiscal Administration). It’s a price that will be pretty hard to beat. I have yet to know anyone who has done this, but Uber’s recent launch into Mexico has been popular among expatriates living in Mérida. The convenience of ordering and paying for a car service via the Uber ap on a smartphone is winning over locals as well. If a report in the Diario de Yucatan is correct, federal officials will be charging visitors to Chichén Itzá and Dzibulchaltun an extra 45 pesos ($2.50 US) on March 21, the day of the equinox. The fee is for shooting video and, according to the Diario, will be imposed on everyone, presumably because everyone has a smart phone or similar device that can shoot video. If the Diario is correct, the admission fee for foreigners will be the normal 232 pesos plus the camera fee for a total of 287 pesos or slightly more than $16 US. According to the Diario, the fee violates federal law, which states the fees can only be imposed on professional photographers and videographers who will use the images for commercial purposes. Violation or not, it appears that the federal government will be collecting the additional 45 pesos on the equinox. Ticket prices to Chichén Itzá went up Jan. 1, 2016 to 232 pesos, but thanks to the weakening peso, the entry price is less for U.S. visitors than it was a year ago. Visitors to Chichen pay for two tickets, 65 pesos to the federal Instituto Nacional de Antropología e Historia (INAH) and 167 pesos to the state CULTUR. The INAH fee increased 1 peso and the CULTUR fee jumped 9 pesos, according to a report in the Diario de Yucatan. The state of Yucatan, without warning, increased entrance fees to its archaeological zones on Monday. According to a new report in the Diario de Yucatan, a ticket to Chichén Itzá for foreign visitors now costs an additional four pesos. Thanks to the weak peso, U.S. visitors will barely feel the increase, which is the equivalent of an American quarter. The new fee to enter Chichén is $210 Mexican (slightly less than $14 U.S.). Of that, the state of Yucatan receives $156 Mexican and the federal government $54. For Mexican citizens and legal aliens, the fee increased two pesos from $145 to $147. Of that, the state receives 83 pesos and the federal government 64 pesos. The ticket fee for the new Chichén Itzá light-and-sound show was slightly reduced from 206 pesos to 201 ($13.30 U.S.). Uxmal, the other major site in Yucatan state, now costs foreign visitors $203 Mexican. Mexican citizens and legal residents are now charged $143 Mexican.